Alison, thank you from the absolute bottom of our hearts for all that you did to make our wedding ceremony so unique & personal. It really was so us, not just in the way in which it was written, but all the smaller details. We especially loved your suggestion of the ring blessing, which was a beautiful way to honour the religious beliefs of some of our guests, and the rainy day playlist which you had on hand to keep our guests smiling while waiting for the skies to clear. Using your own unique processes, you really came to know us so very well, and as our day drew closer we truly felt we gained a friend in you. Better still, a friend and a guide, a source of excitement and encouragement. Honestly, we just feel lucky to have found you. Our guests have not stopped raving about how amazing it was. Thank you again and again! "We have known Alison for many years, so having her as our wedding celebrant was an easy decision! 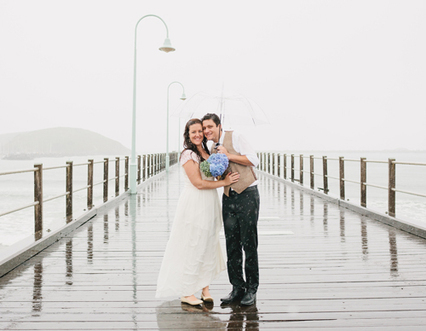 In the lead-up to our wedding (even through the rain), we were calm and stress-free because Alison had everything under control. She created a day for us that was beyond anything that we could have imagined. We felt like she listened to our ideas and created a ceremony that was exactly what we were after, and she was only too happy to participate in some of our 'secret' surprises we had in store for our guests. After our ceremony, we had numerous family and friends comment on what a fantastic job she did, and how thoughtful and memorable she had made our ceremony. 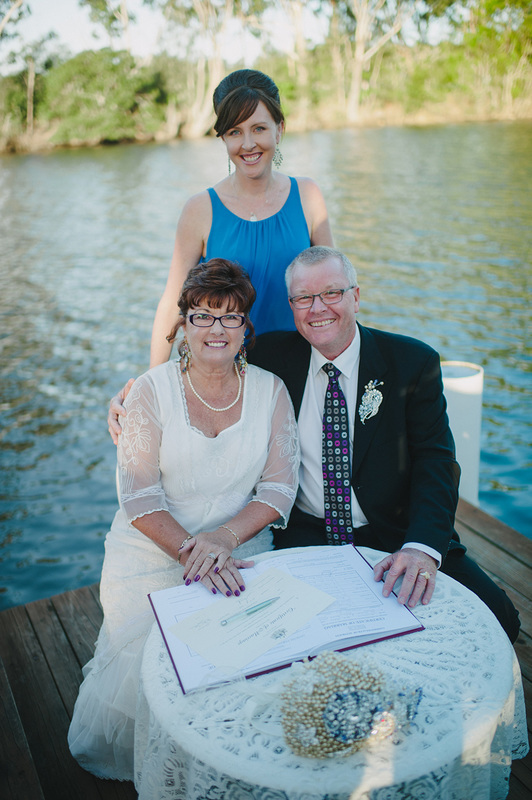 If you're looking for a celebrant, you wont be disappointed with Alison. She is the kind of person who will happily mingle with your guests and make everyone feel at ease. Thank-you so much for making our day so enjoyable and something we will cherish forever!" When we thought of what our ideal ceremony would be - it was one that reflected us as a couple, that our guests could relate to, and that everything in it was meaningful. Already knowing Alison and her flair, adaptability and creativity - it was only a natural choice to have her as our celebrant. Alison has a fantastic, positive demeanour that is reflected in her ceremonies. 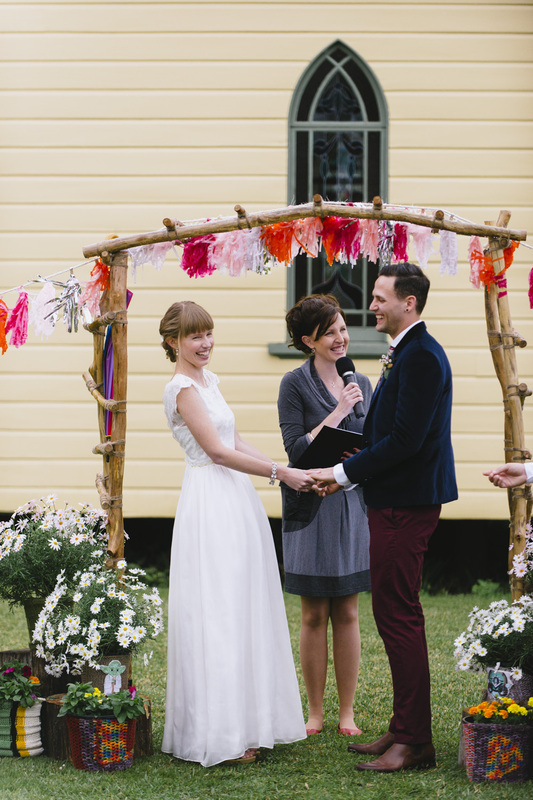 She delivers ceremonies with passion and warmth, and we could not have been more thrilled to have her as our celebrant. Alison gave us such a personal, funny and emotional ceremony - and it was everything we could have hoped for. She has the ability to tailor a ceremony, worked hard to understand us, and made many suggestions and proactive follow-ups that allowed us to have complete trust in her creating our ceremony. A massive heart-felt thank you to Alison, for giving us a beautiful and unforgettable ceremony that we will look back on and treasure. You listened to two, quirky oldies who just wanted a simple, honest ceremony. Your delivery of our 'vows' was wonderful. We felt very relaxed and so did our guests. You were professional in every way but at the same time very warm and friendly. We have no regrets with our choice of celebrant and will recommend you to any other 60 year olds (or younger) who might need a celebrant. 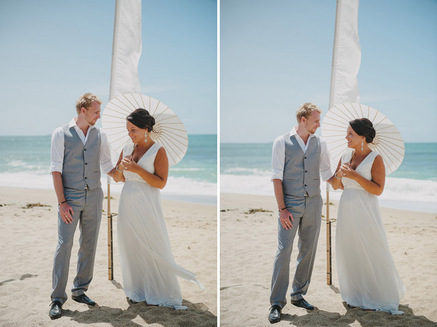 "W﻿ords really don’t do justice to how happy we were with Alison and the cerem﻿ony she prepared for us. We wanted a very low key, hugely personal ceremony and not only did Alison deliver this, she went above and beyond our expectations. If you want a generic “insert you name in here” celebrant than Alison is not for you. She is extremely personal, warm, supportive and professional. The most asked question at our reception was “how long have you known Alison?" Guests were shocked that we had only met with her twice as she captured the absolute essence of Jon and I and everything that was true to us. 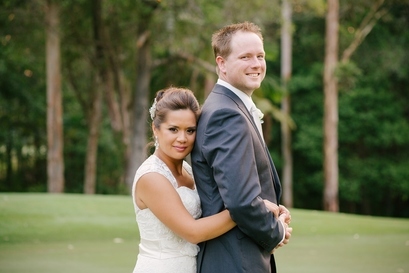 Alison definitely has the love and passion for making your day as special as it can be. We are so happy she was recommended to us. I know our day wouldn’t have been as special without her. We cannot thank Alison enough!!!!" We loved having Alison Bartlett as our wedding celebrant. She was extremely professional, an excellent listener and great fun. Our ceremony was very unique and personal. We are very lucky to have all our friends and family relaxed and ok with the way we chose to do the ceremony. Many people commented that it was very "us" and really enjoyed it. Numerous people said it was the most entertaining and fun ceremonies they have seen. Alison helped us bring it to life and laughter. Alison was able to identify the tone and feeling we wanted for our ceremony and certainly helped make the whole day extremely special. 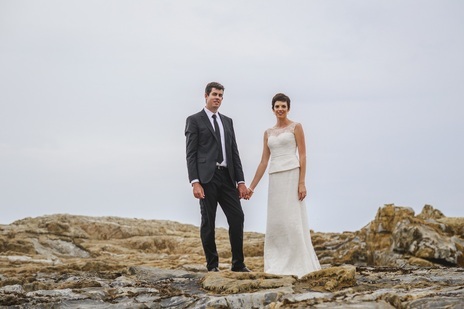 "Having Alison as our celebrant was one of the best decisions we could have made for our wedding. Her professionalism, enthusiasm, confidence and bright persona made us comfortable in our choice of celebrant from the very start. 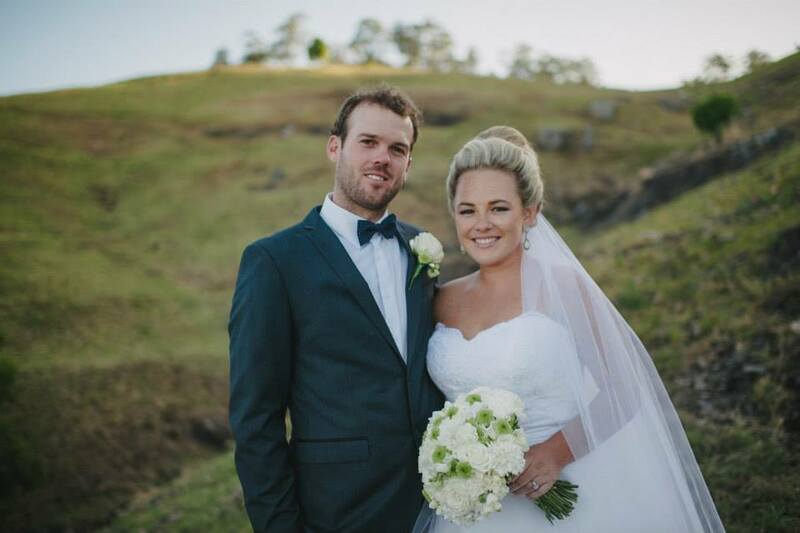 Throughout the process Alison listened to, communicated with us and worked hard to ensure that our ceremony was suited to us and was everything we had hoped for. Alison had lots of great ideas and we received lots of lovely feedback from our guests about the intimate and personalised nature of the ceremony. 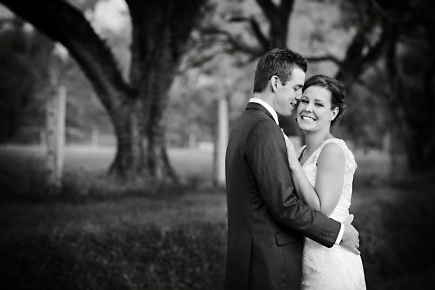 Being married by Alison felt so natural – it felt like being married by a close friend. 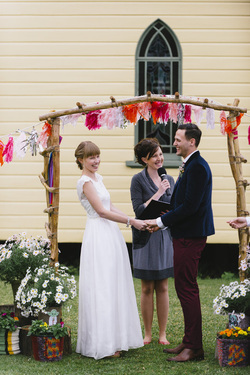 We would definitely recommend Alison to anybody looking for a celebrant. 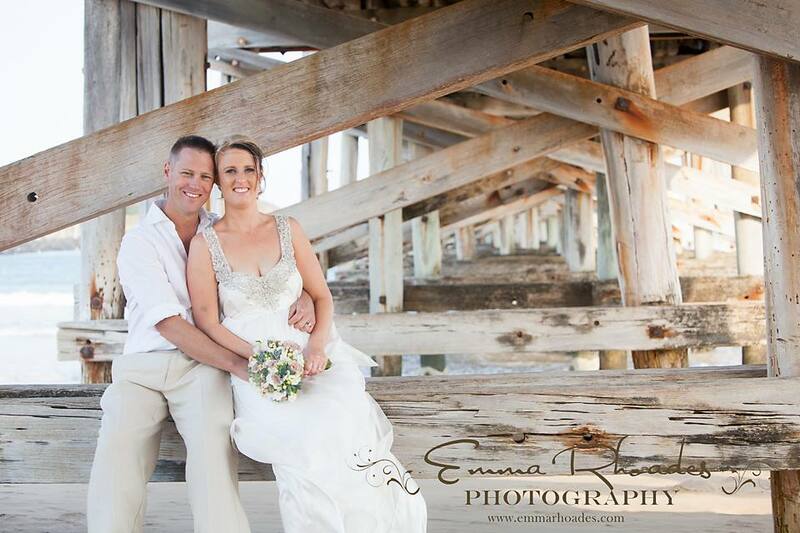 Thank you so much Alison for helping to make our wedding the perfect day that it was!" 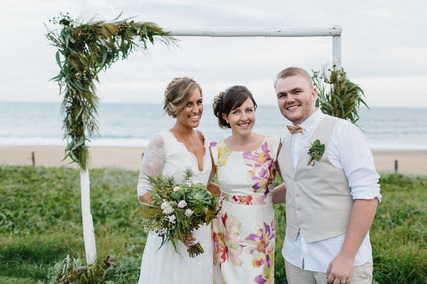 "Nathan and I were lucky enough to have Alison as our celebrant for our wedding day. I couldn't believe my luck finding such a kind, caring person! The whole process was made super easy by Alison, she made our ceremony so perfect and very "us." Alison assisted both of us in choosing readings, helping with anything she could leading up to our big day and always told us she was only a phone call away. Even calming our nerves the night before as it was pouring rain! When first talking to Alison I felt like I had known her for years. She is very passionate about her job and it truly does show with how hard working and willing to do anything to make our ceremony super special! We cant thank Alison enough for creating such a special ceremony for us, we really appreciate everything she did for us. We both received so much positive feedback from our guests with how personal and fun our ceremony was. I would recommended Alison to anybody! She is an amazing lady. Thank you so much again Alison!" "We were lucky enough to have selected the PERFECT celebrant to be apart of our special day. Alison, you helped us keep everything calm, happy and we could all be ourselves around you as you are so easy to get along with. The time and effort you put into our vow's totally reflected on the day as our guest are still talking about how unique and awesome it was. Anyone looking for the best celebrant, look no further then the Alison Bartlett"
Kyle Martin and I would like to thank Alison for the amazing ceremony she gave us on our wedding day!! It was so special and touching. Alison was the perfect choice for our celebrant she was bubbly, friendly and I loved even just chatting with her, an amazing lady!! She told our story like no one else could and went way beyond her duties, even picking a booger from my nose just before the ceremony thank you Alison you are just incredible !! Thank you again for such a wonderful wedding ceremony. From when I saw your website I knew I wanted you as our marriage celebrant. I was very happy when you called from the Brisbane airport (as you were flying to Singapore) to say you would be able to marry us. You were extremely professional, organised and diligent in contacting us in the lead up to our wedding and in preparing our ceremony. We felt very much apart of the process and it was exactly what we wanted and more!! It felt very special, as it was made for us. We had many comments about our ceremony and how great you were. I would love to do it all over again - with my wonderful husband Darren. 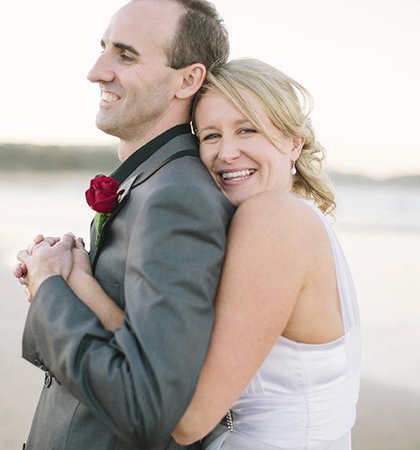 Alison is a friendly and professional celebrant, and it was a pleasure to have her as part of our wedding. The interest she took in our relationship and history to make sure the ceremony was tailor made and special for us was amazing. She went above and beyond to get the ceremony just right sharing lots of knowledge, ideas and suggestions and delivered everything we asked for. We had so many laughs together which helped break the ice and made us feel comfortable telling our story. On the day, Alison was a calming presence for the bride and groom, and as the bride I knew she would have the boys all sorted for when I got there. She always offered to assist in any way she could, whether it was strictly a celebrant task or not. 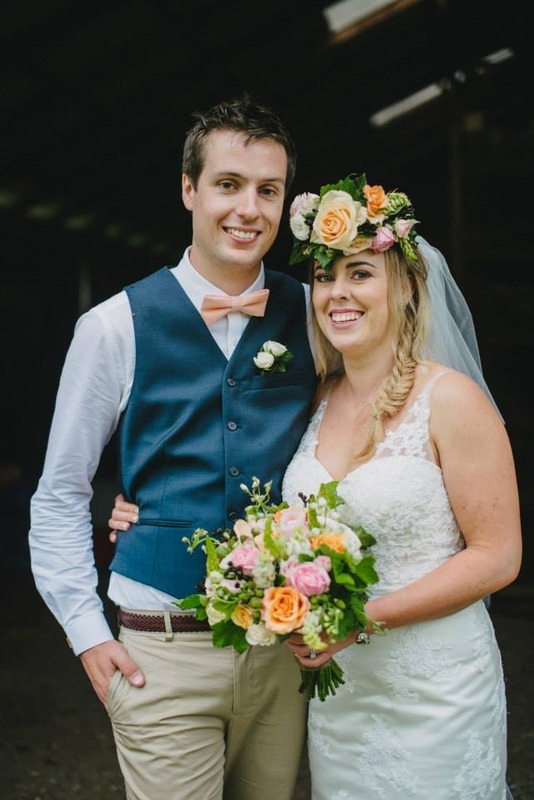 Alison is a lovely person, excellent celebrant and we would not hesitate to recommend her to any couple looking for a celebrant who adds a special touch to any ceremony.